The Border Collie is one of the most popular and well-known sheepdogs worldwide. It is still commonly kept as a working breed. 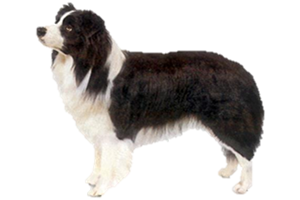 Highly intelligent, Border Collies also excel at obedience and agility trials. For an active family they make excellent pets. The Border Collie was developed Northumberland, located in the border region between England and Scotland. The breed possibly derived from old herding and spaniel stock, and almost certainly including the now extinct Cumberland Sheepdog. They have existed since the 1700s, but did not take their present name until 1915. There are several theories regarding the name collie. The first is that it comes from the Scottish colley sheep, 'colley' meaning 'black', or it could be from the word 'collie', which is Galeic for 'useful'. Is the Border Collie Right for You?